Public speaking skills are ranked number one among the desired skill sets of professionals. 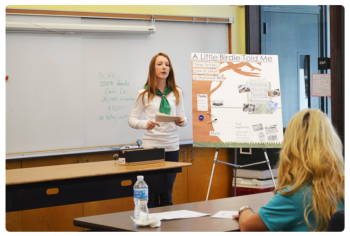 Every 4-H member is encouraged to give a presentation each year. 4-H members practice by giving talks to project groups and at community club meetings, sharing information about the skills they learned in a project, and observing other people giving presentations. 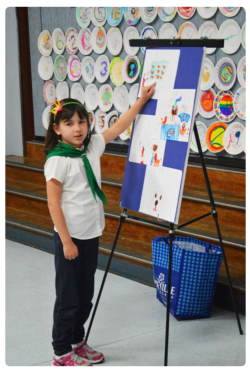 4-H Presentations help youth develop life skills. When youth teach project skills in a presentation format, it demonstrates advanced skills and a deeper understanding of what was learned. There are many different types of presentations, ranging from demonstrations to audio-visual to problem solving. Various presentation styles require similar skills, but are designed to meet the interests and age-appropriate levels of the member. These are examples of different types of presentations. Event Coordinators: Please use the Presentation Manual as a guide for planning your events, and ensure that all Evaluators review the Presentation Manual before your event. Contest Participants: Please refer to the Presentation Manual as a guide when planning your presentation for competition. Please direct questions to Alyssa Sankey, State 4-H Program Representative, at ajsankey@ucanr.edu or (530) 750-1340. Each county holds a Presentation Day, where winners advance to the Area competition. Winners from the Area competitions compete at the State Presentation Day, which is held at State Field Day. Youth compete by age group: junior, intermediate, and senior. More details about each of these events will be posted in the Calendar as they are scheduled. Do you know your Area? Find your county on the Map of Areas.